The virtual assistant Alexa has a 'face' for the first time. Siri may have ushered in the era of the digital assistant, but Amazon's Echo (with Alexa) really took that concept and put it in our homes. The Echo wasn't an immediate, breakout hit -- but having Alexa around to ask questions, manage smart-home devices, play music and much more has turned out to be a pretty great thing. It's a concept Google and Apple are now chasing (to varying degrees), but Amazon isn't standing still. The $230 Echo Show is the first Echo with a touchscreen, and since it was announced, we've been wondering how much a display will really add to the Alexa experience. It depends on what you want to do with it and where you put the Echo Show in your home. But after a week with Amazon's latest, I'm convinced that yet another touchscreen in your life actually makes the Alexa experience better in a lot of ways -- and that's not to mention the special tricks the Echo Show brings. Be the first to review the Echo Show? 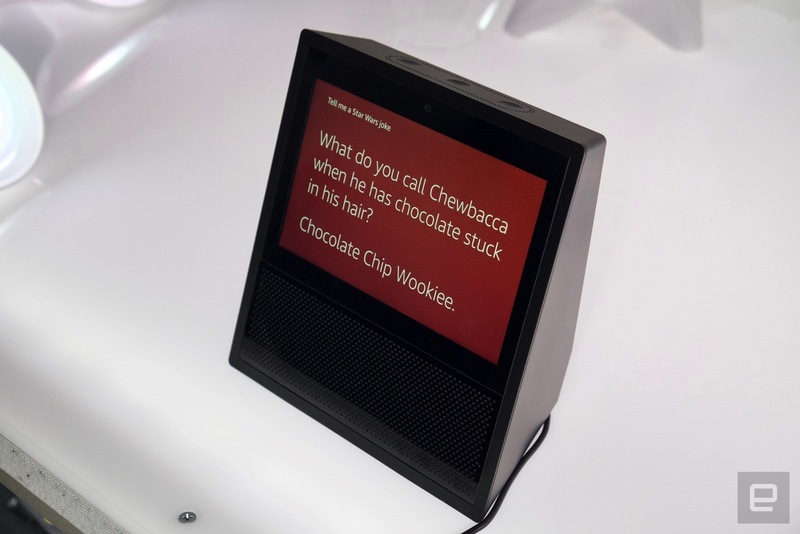 Images of the Echo Show appeared online a few days before it was formally announced, and the immediate reaction was one of disdain. Seeing it in person makes it a little bit better, but there's no way around it: The Echo Show is an oddly angular and blocky device. It's also strangely large, almost bulbous at the base. It's definitely not the sleek cylinder that we've come to associate with the Echo. The matte-black plastic (it's also available in white) picks up fingerprints quite easily -- but this isn't a device that you'll be moving around often, so that shouldn't be much of a problem. It turns out, that wide base houses the Echo Show's two speakers, which perform much better than I expected (more on that later). They make up the bottom half of the device, while the top is dominated by the 7-inch, 1024 x 600 touchscreen. 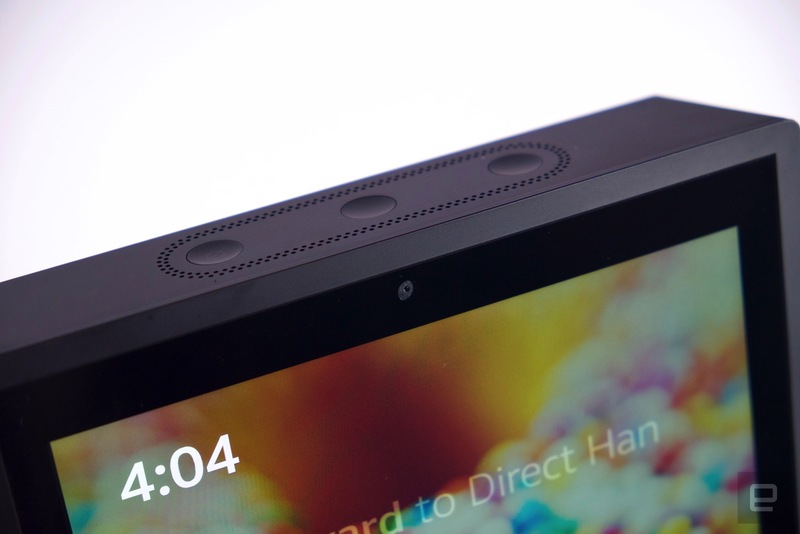 That's the same resolution as Amazon's Kindle Fire 7 tablet, and while it's certainly nothing to write home about, it fits the Echo Show's purpose. It's not something you'll be staring at for hours on end; instead, you're more likely to be giving it quick glances throughout the day. To that end, I found it performed well; it's bright and clear enough, and viewing angles are fine. Given that the Echo Show can play back video from YouTube and Amazon, a panel that hits 720p would have been nice, but I didn't spend any time really thinking that the screen wasn't up to par. On top is a 5-megapixel video camera, which you'll use for video calls and, potentially, third-party services down the line. 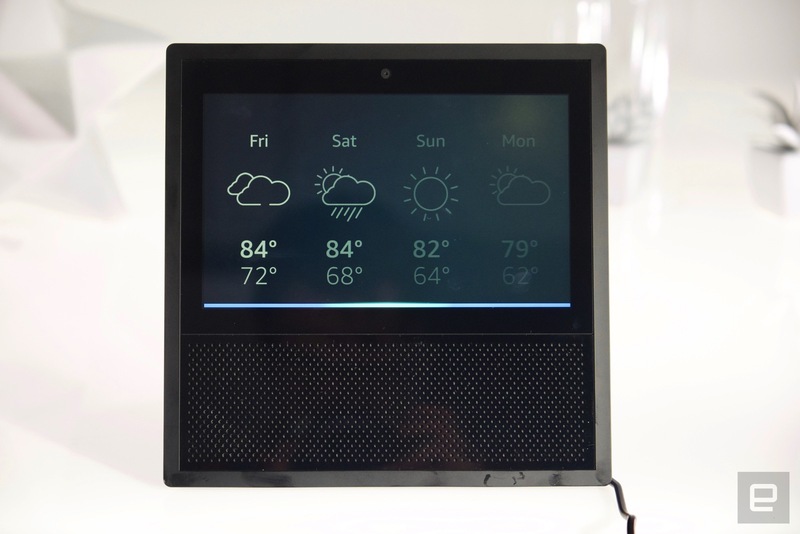 The top features three buttons: two for volume control and one to mute the Echo Show's eight-microphone array. The mics are set in an oval around the buttons up top, but there's no light ring like what you'll find on the original Echo. Instead, the bottom of the screen glows blue when you talk to the Echo Show. That works fine -- it's just not as elegant as the light ring. Overall, the Echo Show hardware is solid and functional, but not much more. I will say, that once I placed it on my shelf, I spent less time thinking about its strange form factor. It does a good enough job of blending into the background, which is really what you want from a device like this. It's not something that'll draw attention, and that works for me. Setting up the Echo Show is a very simple affair and the first time that the touchscreen shows its usefulness. It's pretty easy to go through the setup process right on the device, although the Alexa app for iOS, Android and Amazon's own Fire devices will also do the job. 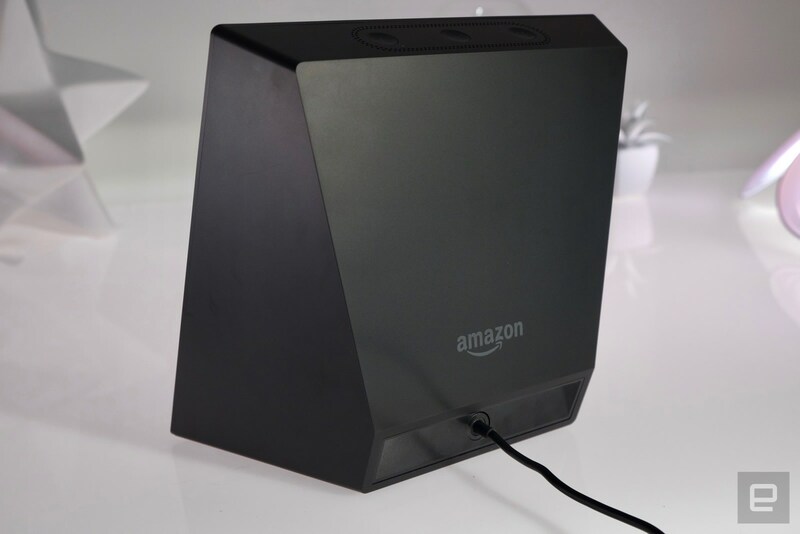 Once you get the Show connected to WiFi and sign in with your Amazon account, you're basically off and running. If you've used an Echo before, everything you can do with that one is an option here, as well. I set up my location (for weather alerts), Google Calendar, my Todoist account and a few music services (including Spotify and Amazon Music) in the Alexa app and then I could easily access my personal info. The default view on the Echo Show is a rotating view of your calendar appointments, to-do items, weather and a bunch of trending news stories. In all cases, the screen prompts you to ask Alexa for more details on whichever particular item is on display. Talking to Alexa works just as well on the Show as the standard Echo; I had very few instances where it didn't pick up my voice right away, though there were definitely occasional moments of confusion as it tried to understand what I wanted. A big part of the value I found in the Echo Show was how useful it was to... well, have the device show me information. When I asked about the weather, Alexa would respond and show me the forecast for the next few days. When I asked about my to-do list, I could see it and hear it as well. Having some time to sit there and digest the info in a visual way was immediately useful. It's not necessary, but it is nice. And if you're not right in view of the screen, you can still talk to the Echo Show and get the info you're looking for. The screen augments most of Alexa's usual features, but it also enables a number of things that you couldn't do before. Chief among those is video calling. Amazon added voice calls and messaging to the Echo family recent, but the Echo Show is the only one with a screen and camera. You can make video calls with anyone who has the Alexa app set up on their phone -- regardless of whether they actually have an Echo Show yet. Unfortunately, as of this writing the feature isn't fully live, but I was able to do a test call with an Amazon representative, and it worked just as smoothly as you'd hope. The incoming call lit up my screen with the name of the caller, and the speaker started playing an alert to get my attention. I could pick up the call with either my voice or by tapping the button that appeared on the screen, and then the call just went on without any issues. Naturally, you can ask Alexa to place voice and video calls as well as send messages. I don't do video calling much, but this could be a killer feature for many families. Being able to do a video call hands-free was definitely better than holding my phone the whole time. But just about everyone has a phone that can make video calls, and that's probably enough for most people. I could imagine this being useful for families with older relatives, though; the Echo Show is probably a bit easier to use. Of course, that means setting up yet another calling service, because the Show doesn't support apps like Skype or Hangouts. What's most intriguing about the Echo Show is how third-party developers will use the new hardware. Alexa is getting more skills all the time, and seeing what makes its way to this new screen will certainly be worth keeping an eye on. Unfortunately, there's nothing out there yet that I can try, but the smart way Amazon has used the screen to enhance existing Echo features makes me excited to see what developers do here. 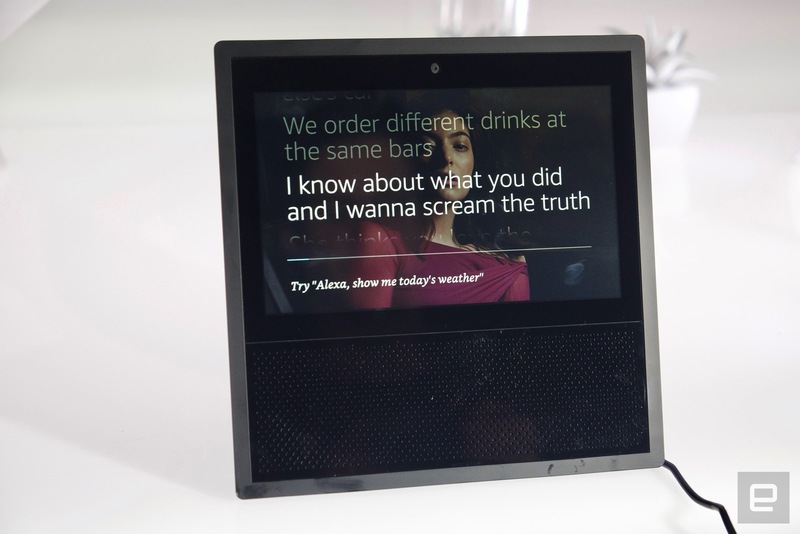 One of the best things about the original Echo was just telling it to play whatever music popped into your head, and the Echo Show is even better in that regard. 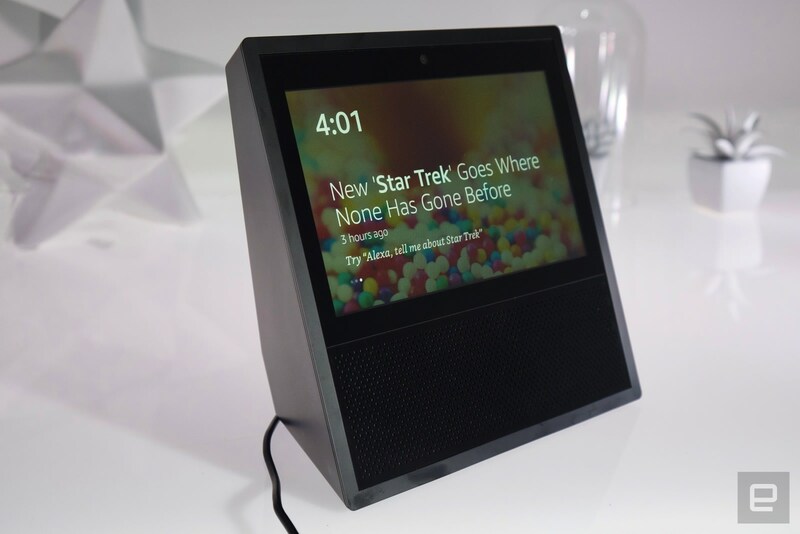 That's primarily because the Echo Show's speaker represents a solid upgrade over the original model. It's still not in the same realm as dedicated audio speakers that Sonos is making, but it's a lot better than the Google Home. The screen also makes searching for music a lot easier. You can ask Alexa to show you top playlists on Spotify or the top songs on Amazon Music and a grid pops up on the display. You can then tell Alexa to scroll to the right to see more, but it's easier to just swipe through the selections. Each item on the list has a number, and you can then just tell Alexa to "play No. 3." If that's too much work, you can still just tell Alexa to play specific albums, songs or playlists, or just tell it to play music from a certain genre. Once the music is playing, the Echo Show displays lyrics from the song, though you can turn that off easily enough if you find it distracting. Depending on where the Echo Show sits in your home, you might even want to watch video on it (despite that low-resolution screen). As you'd expect, you can just say "show me videos on Amazon Prime" or "play clips from YouTube" and things just start right up. Browsing Amazon Prime videos is similar to browsing songs or playlists: There's a list that scrolls to the right and you can then tap or ask Alexa to play your selection. That's fine for casual browsing, but if you want to find a specific movie or video, you'll need to ask Alexa to pull it up. Fortunately, the search is fairly contextual, so you don't have to say the exact title word for word to find the YouTube clip you might be looking for. Alexa also responds to hands-free commands like skipping forward or back, adjusting volume and pausing your content. I don't think I'd watch an entire film on the Echo Show, but if you spend a lot of time cooking and want to watch a few sitcoms while you're at it, it'll do the job nicely. It's worth noting that the Echo Show can also output audio to a Bluetooth speaker, just like the original Echo. So if you have a better speaker lying around and want to upgrade your audio setup, it's a fairly trivial matter. The Echo Show doesn't have any direct competition. If you're considering a voice-activated speaker, your choices are basically the Echo or Google Home. While Google has added plenty of features to Home since it launched last fall, Amazon still has the more-complete ecosystem here. If you're deeply entrenched in Google's world, Home is a good choice, but Amazon works pretty well with most Google services at this point. If you're trying to choose between the standard Echo and the Echo Show, you'll want to consider where it'll go in your home and what you want to do with it. My Google Home typically sits in my living room next to the TV, and I wouldn't want another device with a screen there. But in a kitchen, office or bedroom, this little display could come in handy. Another consideration is how interested you are in video calling and other future features that will rely on the screen. If you buy one without a screen, you're locking yourself out of any potentially interesting use cases that could come down the line. For an extra $50, there's a good chance you'll get a lot of extra functionality out of the Echo Show, and the screen enhances plenty of the day-to-day info you'll want to check on the device. Amazon essentially created a category with the Echo, and the Echo Show marks the first significant re-thinking of what a voice-activated home-hub can be. Ultimately, the screen isn't essential, but it proved to be very useful. And the improved speaker quality is almost worth the $50 upgrade over the standard Echo by itself. 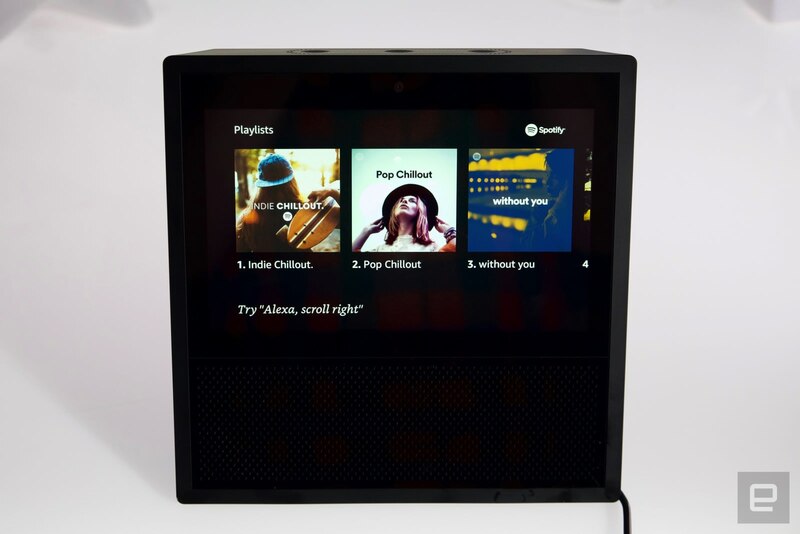 Aside from costing more money, the only downside to the Echo Show is that it's more obtrusive than the slim, cylindrical Echo. But if one more screen won't disturb your room too much, the Echo Show should be a strong contender for people looking for a virtual home assistant.